Since the action-adventure video-game series hit our console screens in the late 90’s and was closely followed by numerous film adaptations, comics and novels; Tomb-Raider has been a firm favourite of many. Those of us that are familiar with the fictional British archaeologist Lara Croft, will know that her life is full of adventure, searching for artefacts, exploring faraway landscapes, solving puzzles, avoiding hidden traps and fighting the enemies. The excitement doesn’t stop there. The famous character has now been bought back to our gaming world in a new form thanks to the impressive efforts of Microgaming, one of the worlds leading software providers. Prepare yourself to experience the game and read on to find out how you can play Tomb Raider slots for free! 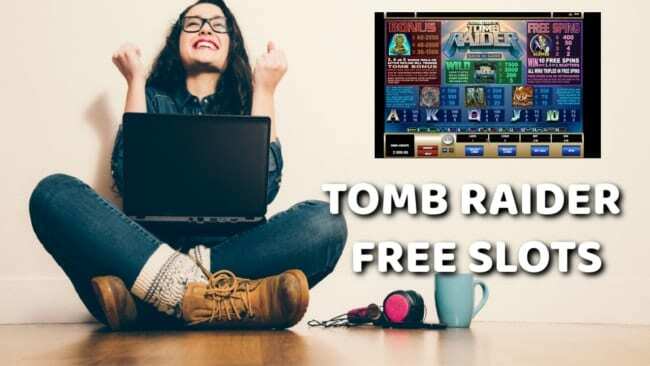 Sites offering Tomb Raider Free slots are more common than you would initially think. There are now hundreds of casinos across the internet that offer players the chance to have a play on this game for very little investment. So how does the feature work, you may ask? It is a five reel and fifteen payline game which means you have multiple ways to win on every spin you make. The game allows you to choose the amount of coins play on each line – anywhere between 1 and 5 coins are allowed and the value of these coins range from £0.05 to £2.00, a preference that you can also set. It is a simple game, but undoubtedly moreish and by playing free slots first, you have the perfect idea of what the feature compromises of. We are being brutally honest when we say that the graphics may not be anywhere near as good as other slot games that grace our screens nowadays. However, if you are a fan of the franchise you may remember that neither were the graphics in the original console game, so the slots do ooze with character! When playing Tomb Raider slots free, you will soon realise that the bonus potential is limited compared to other slots, but the payout percentage is relatively high so players will find that they are winning smaller amounts on a regular basis. Before playing the game, we would also recommend checking out Tomb-Raider RTP. Microgaming have gone to lengths to bring a brilliant, simple yet engaging Free slots to our screens. Not only is the gameplay entertaining but the bonuses and jackpots are pretty impressive too. It is not a progressive jackpot but, for example, lining up 5 of the wild symbols wins you the biggest jackpot in the slot title; a total of 7500x return. The Idols are another symbol to look out for. Landing three, four or five of these idols on an active payline could see you winning up to 2500x the line bet. There is a great extra bonus added to this game when you land three or more of the Lara scatter symbols anywhere on the reels; you will be awarded ten free Tomb Raider slots spins and up to 400x the total bet for five! Look out for the bonus symbol of a statue at any time during the game where you can gain up to 2500 coins and be whisked away to the exciting bonus. If you have three or more statue symbols appear then you are well on your way to a nice win. The bonus takes place in a separate screen showing you a total of 12 statues. Pick five of them and the prizes from each are added up giving you a nice bonus win! The fun doesn’t have to stop when you leave your house. 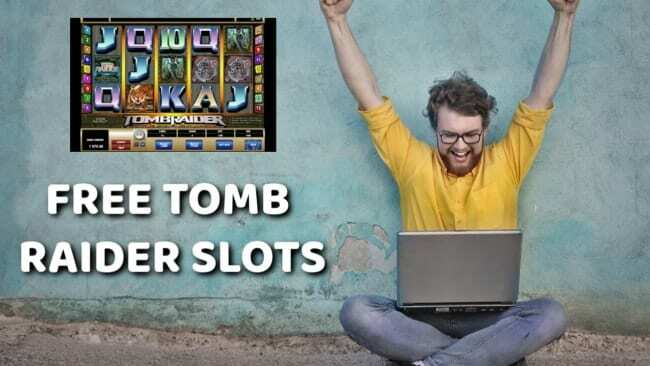 In fact, you can still continue to play Tomb Raider slot machine free on your mobile or tablet device, anytime and anywhere as long as your Internet connection is reliable. We can thank Microgaming for this, and their evolution with the technological age of mobile devices. The feature is compatible with iPads, iPhone, Androids, Blackberry and many more allowing the player the complete freedom and flexibility around their gaming preferences. For those Android users that have devices that do not support streaming of the game, they can use NVIDIA SHEILD. The game is just as impressive on mobile as it is on desktop, utilising the excellent touch feature of smartphones and tablets to spin the reel. Players can begin just as they would on the desktop version, firstly choose the preferred value of coins and the number of lines you want to play, and secondly, press spin! These websites offering no deposit Tomb Raider slots gameplay experiences are well worth taking advantage of. It gives players the freedom to check out the game before making any financial investment into it. It will be a firm favourite for many fans of the films, comics and console games and the slot graphics keep to the classic old school design, maintaining the original characteristics of the franchise. Yes, the returns may be lower than other slot machines at first, but players will be able to bet larger amounts to make up for these losses. Remember that high denomination bets are designed with much higher payout percentages. Playing no deposit slots will allow players to enjoy the game, check out the exciting and classic bonus features including the multipliers, wilds and scatters and make and strong decision on whether this game is for them!